EVG’s patented SmartView®NT Automated Bond Alignment System technology is suitable for Plessey’s requirements because it allows face-to-face alignment of the wafers with very high precision. 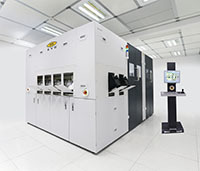 A maximum level of automation and process integration is achieved by the GEMINI Automated Production Wafer Bonding System. Wafer-to-wafer alignment and wafer bonding processes up to 300mm for volume manufacturing are all performed in one fully automated platform.